LAND only Tour: $7,495 Canadian/person. Starts in Johannesburg & finishes in Cape Town. 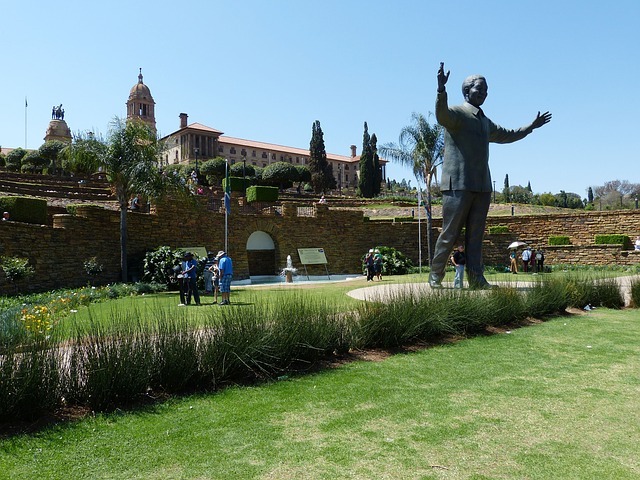 Note that the airfare Johannesburg – Victoria Falls – Johannesburg is included in the LAND price of this extended tour. PLEASE NOTE THIS IS AN ESTIMATE FROM VANCOUVER ONLY VALID AT THE TIME OF POSTING. Special note: We encourage stopping in Europe (usually London) for a 2 - 3-night break on the way to Johannesburg and/or on the way home from Cape Town. This allows you to arrive more rested before the tour begins and/or before you get home! LAND only Tour: $5,195 Canadian/person. AIRFARE: Our flights specialist estimates the cost of the airfare to be approximately $1,500 Canadian departing Vancouver to Johannesburg & returning from Cape Town. This morning we arrive in South Africa and transfer to our hotel near the airport. Our Land Only tour starts today in Johannesburg. Today is free for you to relax after your long overnight flights. For those who are feeling energetic, it is easy to travel into downtown Johannesburg for sightseeing. First of 2 nights near the airport on the outskirts of Johannesburg. Premier Hotel OR Tambo or similar. Breakfast & Dinner. Today we take a short driving tour of Johannesburg which is by far South Africa's largest and most commercially-important city. The mines which gave Jo’burg its nickname, "the City of Gold", are all but gone now. We visit the Apartheid Museum which details South Africa's era of segregation. This is one of South Africa's most evocative museums. Film, text, audio and live accounts provide insight into the implementation and eventual unraveling of the apartheid system. Between Johannesburg and Pretoria, we visit the huge Voortrekker Monument, which honors the farmers of Dutch origin (known as "the Boers") who trekked away from the Cape into the unexplored interior of South Africa on the Great Trek of 1838. This is the most important event in the history of the Afrikaner people and helped to dictate many of the subsequent events in the history of South Africa. The monument depicts scenes from the struggles of the Boers to free themselves from British rule and is surrounded by a frieze showing the ox-drawn covered wagons in which they travelled. Pretoria (now called Tshwane) is South Africa's administrative centre of government and so much of the civil service is based here. The city is carefully laid out on a grid pattern and is a much more relaxed place than Johannesburg. We start our tour at Church Square. Here we see several buildings dating from the Boers' South African Republic of the 1880s, including the Old Raadsaal (parliament), the Palace of Justice, and the Reserve Bank. 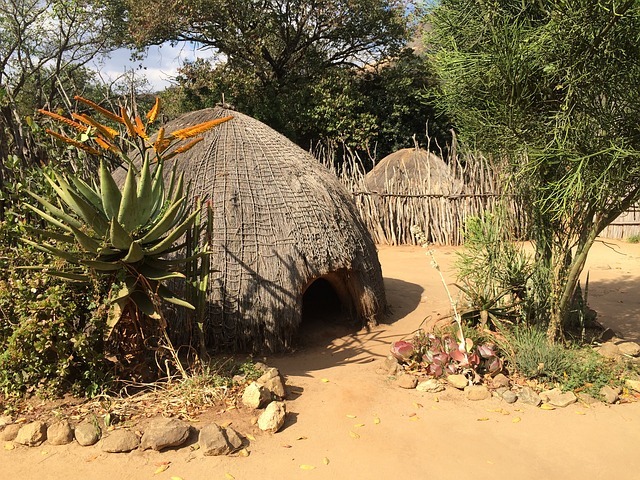 At Paul Kruger's House, we see the simple house of the leader of the Boer republic and learn about the two Boer Wars fought against the British. We also see the Union Buildings, South Africa's centre of political power. These impressive sandstone buildings, built in 1913, are surrounded by beautiful gardens affording pleasant views over Pretoria. Later this afternoon we drive back to Jo’burg. Second of 2 nights outside Johannesburg. Premier Hotel OR Tambo or similar. Breakfast & Dinner. We leave the centre of population in the Johannesburg/Pretoria area (now known as Gauteng) and head east in our own air-conditioned coach across the grasslands of the High Veld towards the Eastern Transvaal (now known as Mpumalanga). As we descend into the Low Veld and the escarpment we come into spectacular scenery of mountains, panoramic passes, valleys, rivers, many waterfalls and forests. We visit the magnificent Blyde River Canyon, a gigantic gorge 26 km (16 miles) long and up to 1 km (over 3,000 feet) deep. Carved out of the face of the escarpment, this is one of the natural wonders of Africa. Nearby Bourke's Luck Potholes are deep cylindrical cavities formed by river erosion. We also visit the charming town of Pilgrim's Rest which is a gold rush town dating from 1873. The entire town today is preserved as a national monument and living museum. First of 2 nights near Kruger National Park. Perry’s Bridge Hollow Hotel near Hazyview or similar. Breakfast & Dinner. Today we have a full day of game viewing in South Africa's largest wildlife reserve, Kruger National Park. This park is almost as large as the state of Israel. It is the oldest wildlife sanctuary on the African continent and is home to 132 native mammal species, 438 species of birds and 1,771 plant species. The mammals include all the African big game species such as elephants, lions, zebras, and giraffe. However, it is not just the sheer number and size of the animals seen here that makes Kruger so famous, but the fact that the park contains a wide selection of plants and animals which are found nowhere outside southern Africa. Second of 2 nights near Kruger National Park. Perry’s Bridge Hollow Hotel near Hazyview or similar. Breakfast & Dinner. Travelling south from Kruger we leave South Africa and enter the independent kingdom of Swaziland. This is a country which, apart from one brief period, has never been ruled by whites. Swaziland was a British protectorate from 1851 until 1966. Today it is the smallest country in the southern hemisphere. The countryside is hilly and green and there is a distinctly "African" feel to the towns. Swaziland is an excellent place to buy African souvenirs and so we visit some of the markets in the main Ezulwini Valley. We also see Mbabane, the capital. Overnight in Swaziland. Mountain Inn or similar. Breakfast & Dinner. From Swaziland, we travel south into South Africa again as we enter the province of KwaZulu-Natal. We pass vast fields of sugar cane as we make our way into the heart of the area which is the homeland of the Zulu people. We learn about the culture and traditions of this proud people as we visit one of their traditional villages. From here we make our way to the main city on South Africa's warm Indian Ocean coast, Durban. First of 2 nights in Durban. Suncoast Towers Hotel or similar. Breakfast & Dinner. After a relaxed start, we have a guided tour of Durban. We see Durban City Hall, which was completed in 1910 and is modelled after Belfast City Hall. The Da Gama Clock commemorates the first sighting on Christmas Day 1497 by the famous Portuguese explorer, Vasco da Gama, of the location that became Durban. He gave the area the name Natal after the birthday of Jesus We also see the Old Fort, where British troops were besieged by Boer forces in 1842. The highlight of Durban is a visit to the famous Botanical Gardens which were founded in 1851. The gardens are noted for their collection of rare Cycads, the scented garden for the blind and the Orchid House. This afternoon you also have free time to enjoy Durban’s spectacular oceanfront beaches along Marine Parade or search for Zulu art in the African Arts Centre. Durban has a famous Sea World where you can feed sharks and watch a spectacular dolphin show. Second of 2 nights in Durban. Suncoast Towers Hotel or similar. Breakfast & Dinner. After breakfast, we board our one hour flight from Durban to Port Elizabeth and start driving down the world-famous Garden Route towards Knysna. We pass Jeffrey's Bay, which is legendary among the world's surfing community. We visit Tsitsikamma National Park which stretches 65 km (40 miles) along the coast. The coast here is wild and rugged, made up of lagoons, cliffs, dunes, beaches, and coral reefs. Inland are wooded ravines, thick with ancient Yellowwood trees, some of them up to 50 metres (164 feet) high. We stop to see one of these giants which is known simply as "The Big Tree". From the heights, we can see the secluded coastal communities of Storms River Mouth and Nature's Valley before we descend to the coast at delightful Plettenberg Bay, South Africa's most upmarket seaside resort. At the pretty resort town of Knysna, we stop at The Heads for views of the surf crashing at the entrance to Knysna Lagoon. First of 3 nights in Knysna. Protea Hotel Knysna Quays or similar. Breakfast & Dinner. Those who wish to join our included hike take the ferry from Knysna to the Featherbed Nature Reserve, a world heritage site, and walk the guided 2.5 km Bushback Trail. We then take our 4X4s up to The Headlands for beautiful vistas. Those who don’t wish to hike today can relax and enjoy charming Knysna. Second of 3 night in Knysna. Protea Hotel Knysna Quays or similar. Breakfast & Dinner. From the richly forested, green coastal plain we drive over the Outeniekwaberge Mountains via the Outeniqua Pass into the semi-desert landscape of the Little Karoo. 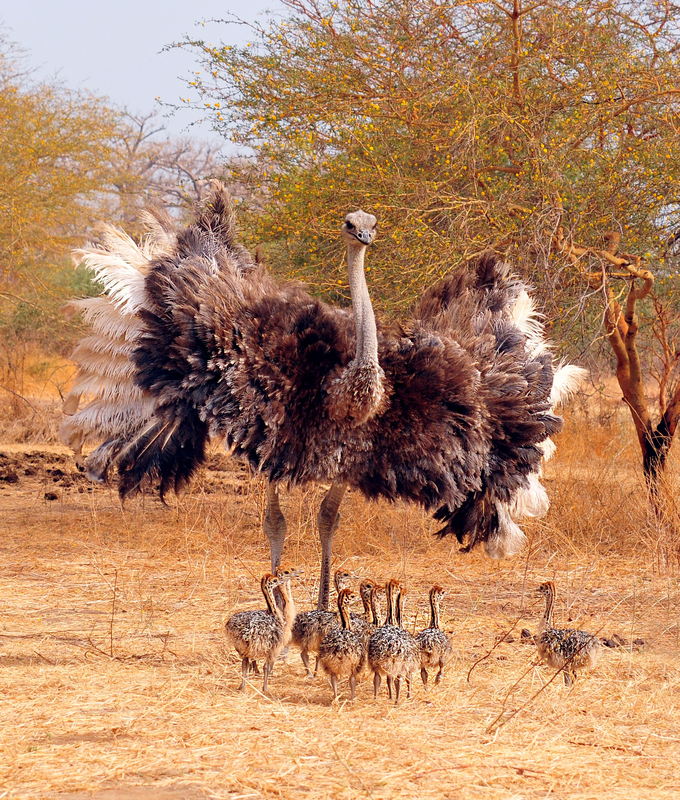 A very high proportion of the world's ostrich population lives in this area, mainly due to the presence of ostrich farms. Between 1880 and 1910 these ostrich farms made small fortunes exporting feathers to fashion houses in Europe and North America for use in hats and feather boas. The owners of these farms built mansions known as "feather palaces", some of which can still be seen. Outside the town of Oudtshoorn (known as "The Feather Capital of the World") we visit an ostrich farm to learn about these strange, flightless birds. They can reach a height of 2.5 metres (8 feet), weigh up to 135 kg (300 lbs) and run at speeds of 50 km/h (30 mph). Ostrich feathers may no longer be the height of fashion but they are still used to make feather dusters. Ostrich skin is turned into leather for use inexpensive handbags and shoes. The massive, thick egg shells are so strong that you can actually stand on them without breaking them. The shells are used to make souvenirs while ostrich meat is sold dried or fresh. During our visit to the ostrich farm you have a chance to sample ostrich meat and, if you wish, actually ride on an ostrich. 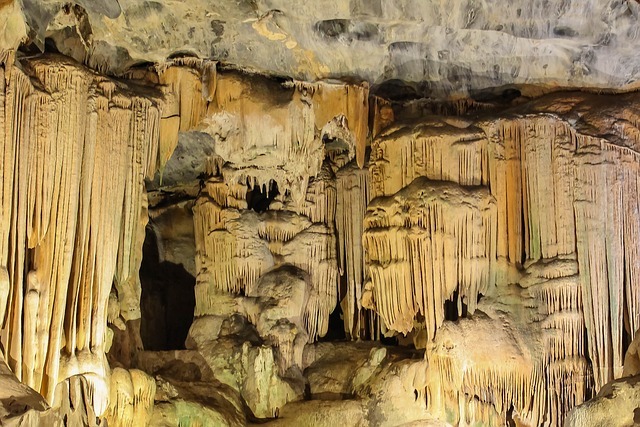 Near Oudtshoorn, we visit one of the natural wonders of the world, the Cango Caves. These huge, multi-coloured, limestone caverns filled with stalactites and stalagmites are just part of the massive underground system that extends far under the Swartberg Mountains. In the town of George, we see some fine, old Dutch buildings including the Public Library, which dates from 1840, and the Dutch Reformed Mother Church, with its magnificent carved wooden pulpit. Third of 3 nights in Knysna. Protea Hotel Knysna Quays or similar. Breakfast & Dinner. Today we travel along the southern section of the Garden Route, through spectacularly varied scenery. Our first stop is the seaside town of Mossel Bay, site of the first landfall made by Portuguese explorer Bartholomeu Dias in 1488. Here we visit the museum dedicated to this adventurer, housed in a converted granary. The museum is dominated by a life-size replica of Dias' caravel sailing ship and features exhibits on early Portuguese, Dutch and British maritime explorers. We will also see the oldest post box in South Africa. Leaving the coast, we travel through the town of Albertinia, set among rolling wheat fields. The peaks of the Langeberg Mountains form a dramatic backdrop to the village of Heidelberg. We stop in Swellendam, the third oldest town in South Africa. Founded in 1743, the town and its surrounding area feature 80 sites of historic interest. The town even declared itself a republic for a brief time in 1795. Here we see buildings built in the delightful and distinctive Cape Dutch style. The 1911 Dutch Reformed Church is another highlight. Leaving Swellendam we pass through the Cape Winelands, a fertile area that produces much of the country's fruits and vegetables. First of 3 nights in Cape Town. City Lodge V&A Waterfront Hotel or similar. Breakfast & Dinner. 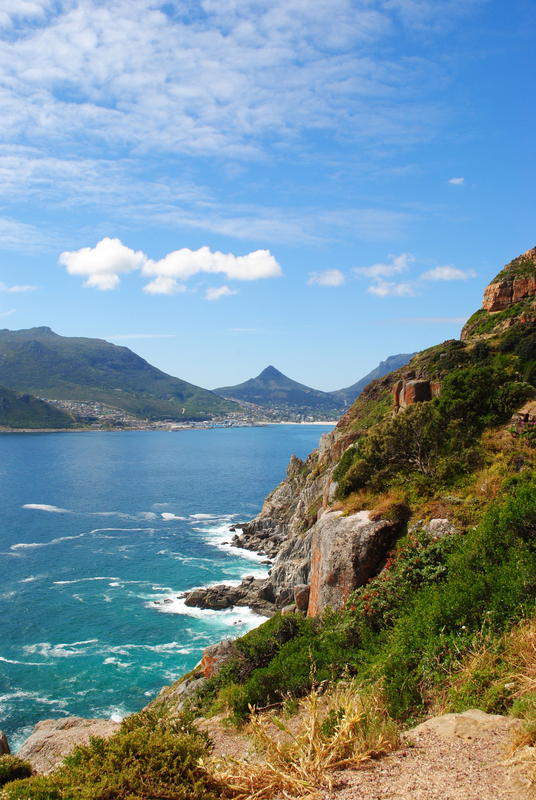 Today we take a guided tour of South Africa's "Mother City". Although Portuguese navigator Bartholomeu Dias circumnavigated the Cape of Good Hope in 1488, it was not until 1652 that Jan van Riebeeck established a Dutch settlement at Table Bay to supply fresh produce and meat to the fleets of the Dutch East India Company on their voyages between Europe and the spice islands of the east (today’s Indonesia.) One of the early nicknames for Cape Town was "The Tavern of the Seas". Cape Town's streets are laid out in a grid pattern on flat land stretching from the sea to majestic Table Mountain. If the weather is suitable, we will ride the gondola up 1,086 metres (3,562 feet) to the summit of Table Mountain for spectacular views of the mountainous spine of the Cape Peninsula, Table Bay, and Robben Island, where Nelson Mandela was imprisoned for nearly twenty years. We start our tour of the city itself at Greenmarket Square, which was created as a market in 1710. This was originally the place where public proclamations were read, including an 1834 declaration freeing slaves. The square is the site of Cape Town's first civic building, the Burgher Wachthuis, built between 1751 and 1761 to house the town guard. Today it is known as the Old Town House and is considered to be one of the finest examples of Cape Baroque architecture. Nearby we see the Castle of Good Hope, which is the oldest building in South Africa. The Castle was completed in 1679 to protect the new settlement against possible attack. Built in 1905, the old City Hall is a blend of Italian Renaissance and British colonial architecture. The Groote Kerk stands on the site of the oldest Dutch Reformed Church in the country and its bell tower dates from 1701. In this area is a large park known as the Company Gardens. This is the area where the Dutch East India Company's settlers first started growing their own produce in 1652. Today over 8,000 species of exotic plants grow in the gardens. The gardens are bracketed by some of the finest architecture in the city. The Houses of Parliament were built in 1884 and enlarged in 1910. De Tuynhuys is the office of the state president. The Cultural History Museum building housed the Supreme Court from 1810 to 1967. This afternoon, if the weather is suitable, we take a 30-minute ferry ride out to the infamous Robben Island, whose prison was once home to former South African president Nelson Mandela and many other members of the African National Congress (ANC.) The island is now a World Heritage Site and provides stunning views across the bay with Table Mountain as its backdrop. Our trip to the island offers a glimpse into the apartheid era as we tour the prison with a former political prisoner as our guide. Upon returning to Cape Town, the V&A Waterfront is still a working harbour. The Waterfront has been revitalized in a way similar to Fisherman’s Wharf in San Francisco and has become South Africa's most visited tourist attraction. There are over 250 shops from designer boutiques to craft stalls, a host of restaurants and coffee shops and plenty of other activities, including the South African Maritime Museum with its interactive displays on the history of local shipwrecks. Second of 3 nights in Cape Town. City Lodge V&A Waterfront Hotel or similar. Breakfast & Dinner. Cape Town itself is located at the base of a peninsula and is part of a diverse area of towns, mountains, and beaches which we will explore today. 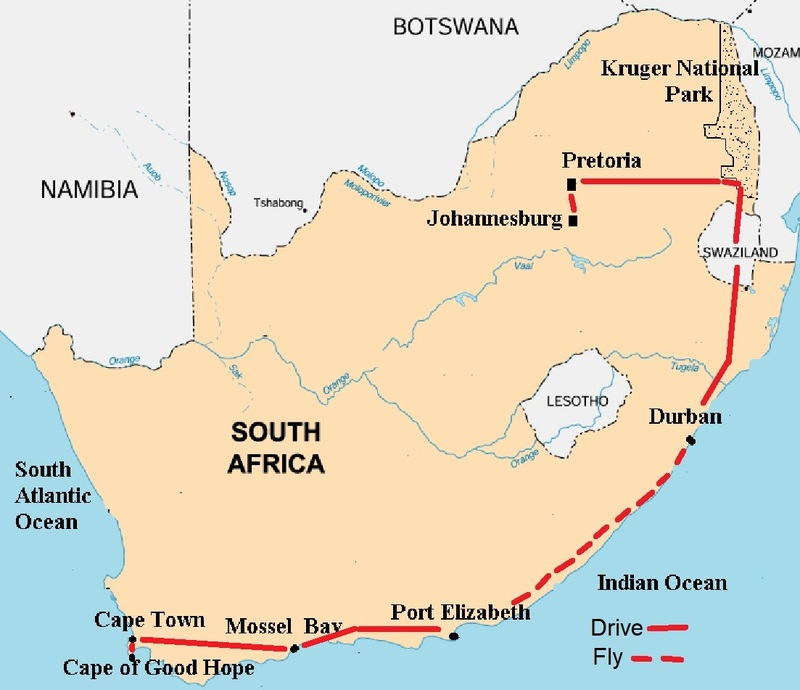 The Cape Peninsula is a 100 km (60 mile) long spit of land forming the most south-westerly point on the African continent. Off the tip are the treacherous waters of the Cape of Good Hope. Crossing the base of the peninsula, we pass the Groote Schuur Hospital where Professor Christian Barnard performed the world's first successful heart transplant in 1967. The first section of our coastal drive takes us along the sheltered shores of False Bay past beautiful beaches and small seaside towns. Simon’s Town is the home of the South African navy. The town was also a base for the British Royal Navy from 1806 until 1957. There are 21 buildings along the main street which are over 150 years old. Most have been restored to their original Victorian splendour. At the sheltered little beach known as Boulders, we will see a colony of 700 Jackass penguins. The southern end of the peninsula is protected as the Cape of Good Hope Nature Reserve. The plants of the southern tip of Africa are so different from those found anywhere else that the area has been defined as one of the six floral kingdoms in the world. The Cape Floral Kingdom (or fynbos region) covers about 70,000 sq km (27,000 sq miles) and is home to 8,600 species of flowering plants. The Cape Peninsula alone is home to over 2,600 indigenous species, including dozens of species of proteas and hundreds of species of heathers. There are many more species of heather here than there are in Scotland! The reserve is also home to baboons, zebras and several species of antelope. At Cape Point itself, we can see the most powerful lighthouse in the world. Turning up the west side of the peninsula, we will pass fishing villages and beaches too wild for swimming but favourite spots for local surfers. Carved into the solid rock face, Chapman's Peak Drive is considered one of the most spectacular coastal drives in the world. Above the road, vertical sandstone cliffs rise 700 metres (2,300 feet) to the summit of Chapman's Peak while the cliff below drops away equally vertically. At the northern end of this 7 km (4 mile) series of twists and turns is the lobster fishing town of Hout Bay which once declared itself an independent republic and issued its own passports. From here we head back into Cape Town through some of its most fashionable suburbs. A highlight today is our visit to the 560 hectares (1,380 acre) Kirstenbosch National Botanical Gardens. Beautifully situated on the eastern slopes of Table Mountain, the gardens are dedicated to the preservation of plants indigenous to southern Africa, including many species of protea – the national flower. The gardens are located in the upmarket suburb of Constantia. Third of 3 nights in Cape Town. City Lodge V&A Waterfront Hotel or similar. Breakfast & Dinner. We descend to the valley floor and visit the charming town of Franschhoek. The name means "French Corner" and refers to the 200 Huguenots who were given land here in 1688 and who went on to revitalise the fledgling South African wine industry. The Huguenots were French Protestants who fled to South Africa to escape religious persecution. The Huguenot Monument commemorates this critical event in the history of South African winemaking. Franschhoek town has many old buildings and quiet tree-lined streets. We drive on to the town of Paarl, a name almost synonymous with South African wines. Shady oak trees and imposing old buildings line Main Street. On the southern slopes of Paarl Mountain is the Taal Monument which celebrates the successful struggle to have Afrikaans recognised as one of South Africa's official languages. The Paarl Wine Route is home to the award-winning Fairview Estates and the KWV Cellar Complex, the largest in the world. In the distance, one can see the Hex River Mountains, which form a natural barrier between the fertile vineyards and orchards of the Boland and the sunburned Karoo. From Paarl, we travel over the 366 metre (1,200 foot) Helshoogte Pass to elegant Stellenbosch. Founded in 1679, this is the second oldest town in the country and is home to South Africa's first Afrikaans-language university. Lined with ancient oak trees, Dorp Street is notable for its large number of carefully restored historic buildings. There are over 60 wine estates in the Stellenbosch area and we will stop at one for a wine tasting in this heavenly setting. This afternoon we leave the fertile Winelands valleys and cross the mountains back to Cape Town. Our Land Only tour finishes upon arrival back in Cape Town. For those taking our international flights for the rest of the afternoon is free until we transfer this evening to the airport for our overnight flight to Europe. Note: This tour includes a ride on the gondola up Table Mountain. However, even in the southern Summer, the weather on Table Mountain is very variable and it is pointless going up the mountain if it is shrouded in cloud. Our visit to Table Mountain is scheduled for the day after we arrive in Cape Town. However, it may be postponed to another day should the weather be unsuitable. In extreme circumstances, it may not be possible to ascend Table Mountain on any of the days we are in Cape Town. In this very unlikely circumstance, other sightseeing will be substituted. Our excursion by boat to Robben Island depends on suitable sea conditions. This trip may have to be postponed or cancelled if the sea crossing is too rough. This morning we arrive in South Africa. Our Land Only tour starts this morning in Johannesburg. We connect to our short flight from Johannesburg, South Africa to Victoria Falls, Zimbabwe. After transferring to our hotel, we have a free afternoon for you to rest up after your long overnight international flights. 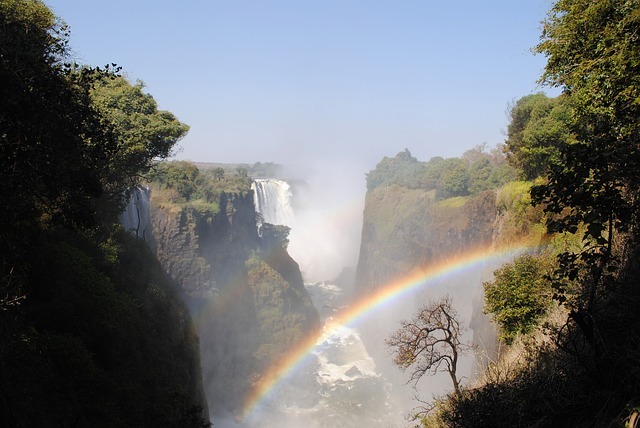 You will enjoy exploring the relaxed town of Victoria Falls. This is one of the best places to buy genuine African souvenirs at reasonable prices. The falls and town are situated in a 23.4km² international park which includes Victoria Falls National Park in Zimbabwe and Mosi-Oa-Tunya National Park in Zambia. First of 2 nights at Victoria Falls. Shearwater Explorers Village or similar. Dinner. We have a relaxed day exploring Victoria Falls on the Zimbabwean side. The local Makalolo tribe's name for the falls translates as "The Smoke That Thunders". When Scottish missionary and explorer David Livingstone became the first white man to see them on November 16th, 1855 he renamed them, Victoria Falls. Victoria Falls was inscribed as a World Heritage Site in 1989 for being one of the most spectacular waterfalls in the world. This is the world's largest sheet of falling water with up to 145 million gallons per hour cascading over the 7 different sections of the falls and falling 108 metres (350 feet) into the basalt Batoka Gorge below. Here we see the statue of Livingstone and view the Devil's Cataract. The spray thrown up by the falls creates a special rainforest microclimate along the rims of the falls, in what is otherwise a very dry area. Victoria Falls are on the Zambesi River, which forms the border between Zimbabwe and Zambia. Second of 2 nights at Victoria Falls. Shearwater Explorers Village or similar. Breakfast & Dinner. This morning we drive from Victoria Falls in Zimbabwe to Chobe National Park in Botswana. 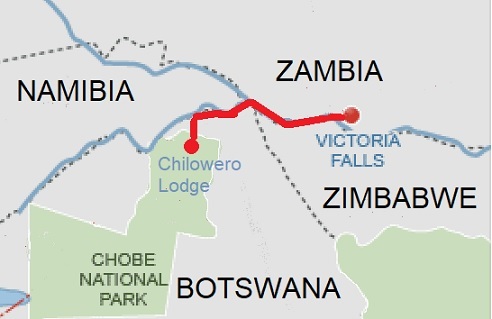 This is possible because close to Victoria Falls four countries - Zimbabwe, Zambia, Namibia and Botswana - come together. After settling into our lodge by the Chobe River, we head out on an afternoon game viewing expedition The floodplains and their different vegetation types, plus the combination of wetlands, dry woodlands, and savannahs afford opportunities to see a wide variety of game including elephants, buffalo, giraffes, zebras and many varieties of gazelle. First of 2 nights near Chobe National Park. Sanctuary Chobe Chilwero Lodge or similar. Breakfast & Dinner. Botswana hosts the highest percentage of land set aside for wildlife preservation in the world. 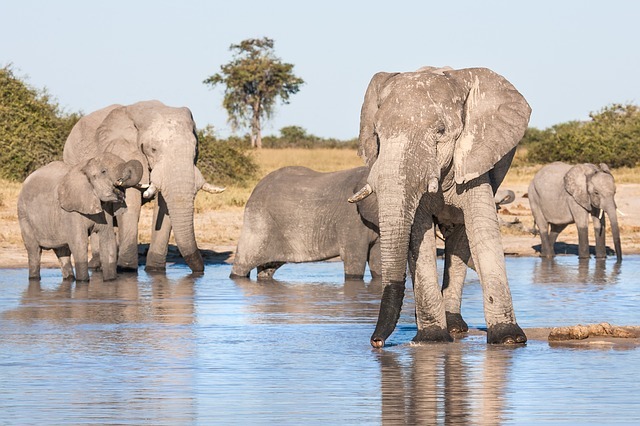 Chobe National Park is home to the largest concentration of animals in Botswana, especially elephants. It is estimated that at least 73,000 elephants inhabit Chobe. The Chobe River winds through the park and a highlight is game viewing on the river. Today we start our day with an ‘game drive’ at dawn when the animals are most active. We return to our lodge for breakfast. Later in the afternoon, we head out on another game viewing expedition as the animals are re-emerging as the day cools down. This time we travel by boat on the Chobe River where we will see many species of animals that use the river to drink and bathe. The birdlife in this area is amazingly varied. Second of 2 nights near Chobe National Park. Sanctuary Chobe Chilwero Lodge or similar. Breakfast, Lunch & Dinner. Early this morning we drive from Chobe National Park in Botswana back to Victoria Falls in Zimbabwe, where we fly back to Johannesburg. Upon our arrival mid-afternoon, we transfer to our hotel near the airport. The latter part of the afternoon is free for you to relax after our early start this morning. First of 2 nights near the airport on the outskirts of Johannesburg. Premier Hotel OR Tambo or similar. Breakfast & Dinner. - Accommodation mainly in the equivalent of good North American 4-Star hotels and lodges. All our hotels have en-suite bathrooms and air-conditioning and are of a very high standard. - Breakfast and dinner every day. 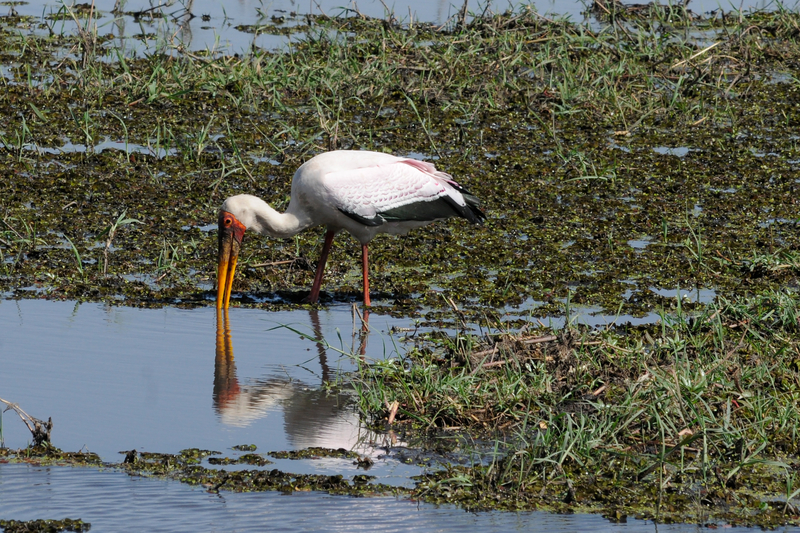 One lunch at Chobe National Park. Often we take dinner in the hotel (especially if we have had a long day of sightseeing). However, sometimes we include dinner at a special restaurant in town, especially when we are in cities.- -Land and water transport by our own coach, safari vehicle, ostrich (optional! ), ferry and river cruise boat. - Sightseeing, wildlife viewing and entrance fees as mentioned in the itinerary. Our flight specialist suggests flights from Vancouver to London Heathrow with Air Canada and from Heathrow to Johannesburg with South African Airways. On your return, we suggest flying Cape Town to Heathrow with British Airways and Heathrow to Vancouver with Air Canada. However, we have the ability to book your flights with any airline. You do NOT have to come to Vancouver to join this tour. We can put you in touch with our flights specialist or you are welcome to book your own flights from your home city. Please let us know. Our published price is based on 2 people sharing a room. If you would like to share, we will do our best to match you with a roommate. The EARLIER you pay your deposit, the more likely we are to find you a roommate. If you wish to be guaranteed a single room, there is a Single Supplement charge of $1,040 Canadian for our South Africa & Swaziland tour or $1,360 Canadian including our Victoria Falls & Botswana extension. Those people traveling alone but wishing to share will be informed 3 months prior to departure if a roommate is not currently available. At that point, you will be invoiced for the Single Supplement. If a roommate subsequently joins the tour, your single supplement will be refunded with the final documentation. The land portion of the tour must be booked directly with Royal Heights Tours. You can secure your place on the tour with a $400 per person non-refundable deposit. We take payment by cheque, VISA or Mastercard for the $400 /person deposit. Your invoice for your Land tour will be e-mailed to you in late August 2019. Payment will be due by September 23rd 2019. Price quoted is for FINAL PAYMENT by cheque. Should you wish to pay the outstanding amount for the LAND tour by credit card there will be an administration fee of 3% on the outstanding amount. Group limited to a maximum of 16 travellers. Please pay your $400 deposit early. -This tour is not suitable if you need walking assistance in the form of walking sticks or canes. You must be in reasonably good shape to enjoy this tour. There is a fair amount of walking in natural areas and to viewpoints which our bus cannot reach.